I went over to Billericay this morning for the first time in about three weeks. I normally go there once every week or 10 days - not only to peruse the charity shops but also to get a few tasty bits and pieces in Waitrose. Waitrose is an expensive shop but they do have a wonderful array of delicacies which are completely unavailable in my small town, where only Aldi and Somerfield are available for food shopping. Some changes had occured in Billericay in the past three weeks - and none of them good really. One, I'd missed the annual 'Linen and Lace' event in the Oxfam shop there. Now this is a bit of a b*gger as they do have some really nice craft bits and pieces during the 'Linen and Lace' and I've got some excellent things there in the past. 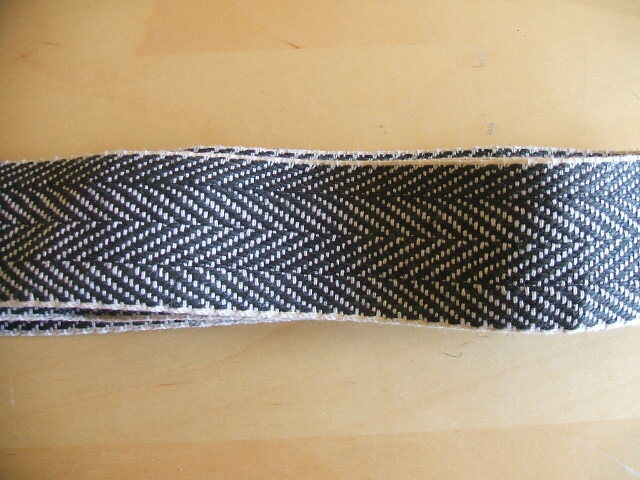 This time all I came away with was a length of black and white herringbone webbing which will come in useful for bag handles at some point. The second 'bit of a b*gger' was one of the cheaper charity shops was closed for refurbishment. That can only mean higher prices when they re-open. This is one of my perennial grouses - why do charity shops feel they have to emulate upmarket boutiques?? Give me a grotty charity shop with reasonable prices any day. The third 'bit of a b*gger' was that the council have removed the very convenient pedestrian crossing which was right outside one of the best charity shops and relocated it much further down the high street - why?? I guess it was done to speed the flow of traffic and not for the convenience of pedestrians! Anyway, enough of the moaning! I did find one of my favourite crime writers latest book in the 29p basket in the first charity shop I called in at. 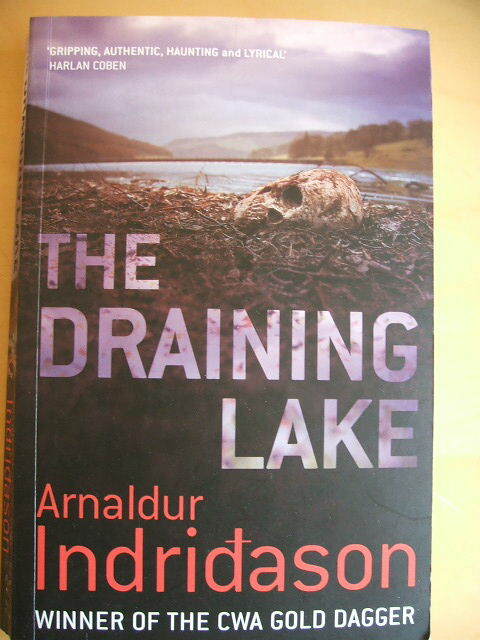 I love a good crime novel, and the books by Arnaldur Indridason combine not only a really good thriller but are also set in Iceland - two of my favourite things in one. I only came across his books by finding one in a charity shop last year and they are excellent. If you enjoy a good crime / thriller type book I can highly recommend these. He hasn't written many - well, not many have been translated into English put it that way - and they also give a fascinating (to me anyway) insight into Icelandic life. Finally, on to something a little more frivolous. 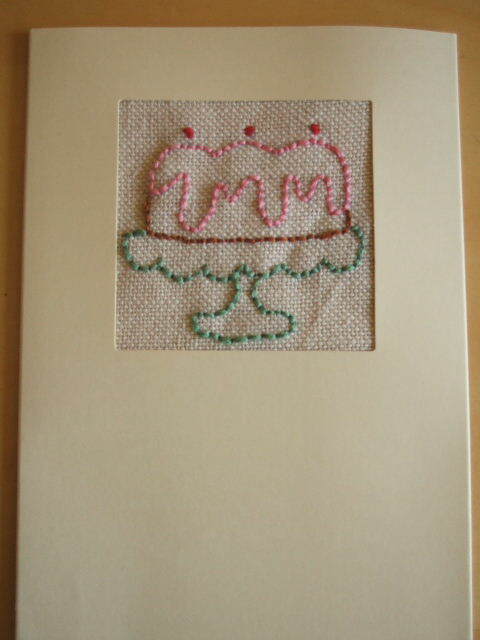 I've been doing a bit more embroidery and have just finished these two cake cards. Both done using the iron-on transfers from the fabulous book Sublime Stitching by Jenny Hart. I hate it when that happens to charity shops - they have done it to mine and it simply isn't the same since. 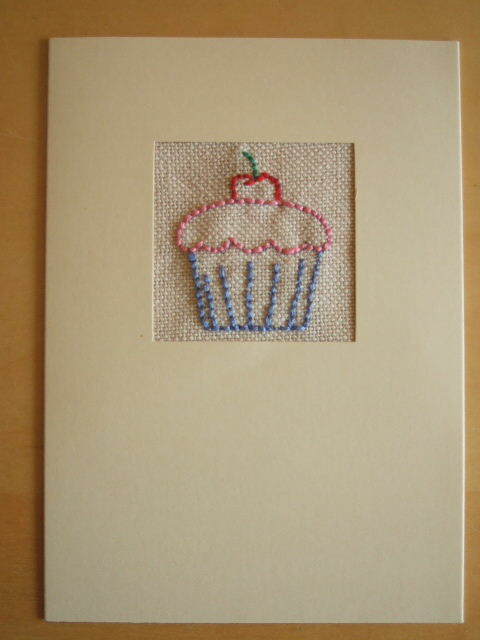 Cards are pretty though - the craft shop round the corner from my house, and where we relocated our craft group to, has just started stocking the Sublime Stitching transfers. I'm now working on them to get the Sulky transfer pens in.... They only opened in November bless them!